For this week, I decided to make wheels for my antisocial robot. My main design constraint was that I wanted to cast a silicone tire around a rigid hub. This meant that I had to design some kind of locking mecanism to prevent the silicone from slipping off the hub. As usual, I modeled my design in Fusion. For my first iteration, my wheel was a simple extrusion with little semi cylinders interlocking with the hub. The structural problem with this design was that the tire could slip in the lateral direction (it was only fixed along the radial directions). 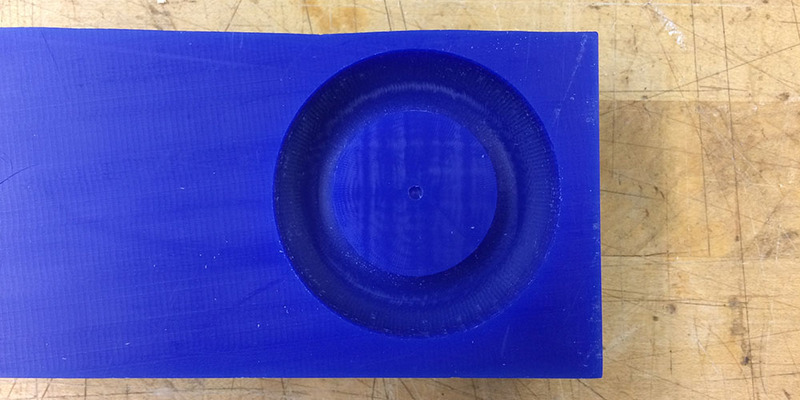 Also, this design did not utilize 3-axis machining, which was the main purpose of the assignment. Bound and determined to make something useful from this assignment, I tried a second iteration wheel design. 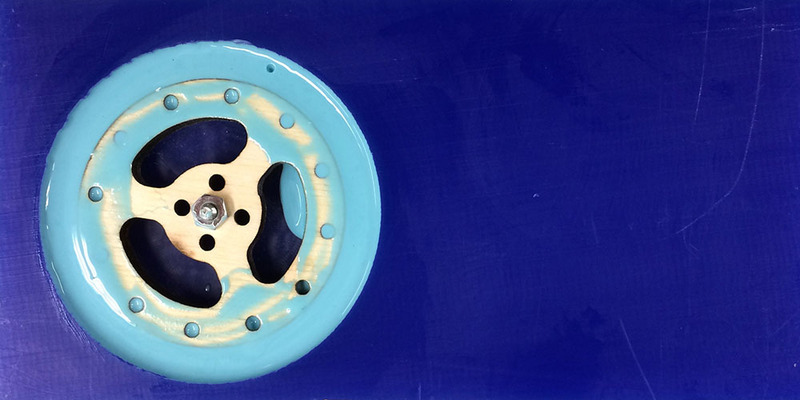 This time I included holes through the hub for the silicone to flow into and hopefully lock the wheel. This design also included some charming filleted edges (yay 3-axis machining). I wasn't sure if this would be easy to pour because the distance between the hub and the edge of the mold was only about .25 inches. I really didn't want the tire to be thicker than that so I decided to mill it out and see what would happen. Preparing the model for the shopbot was a hassle, mostly because I have no experience with mastercam. It turns out you only want to import the surface of your model that will be milled by the machine. Calvin, Eytan and Zach helped me prep my model for milling. I ended up using a 1/8" flat endmill, a rough cut pass, and a radial finishing pass. The milling job itself only took about 15 minutes. The surface finish was pretty decent, but certainly not shiny smooth. Next I needed to drill a hole through the center of the wheel mold so I could clamp the hub to the wax mold with a screw and nut. Nicole, Eytan Calvin (what teamwork this week!) helped me set up the drill press. And let me just say, this was the most complicated set up for a drill press I have ever encountered. Instead of a simple table I could just clamp my wax mold to, this drill press had a vice. 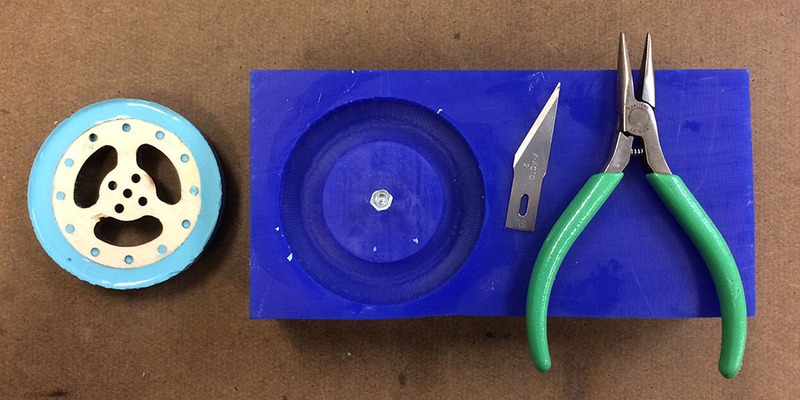 Because my wax was so small, we had to use several scrap pieces of wood to center my mold to the drill bit. Unfortunately I didn't get a chance to take a picture of this set up. The longest 4-40 screws I was able to find at the hardware store were only 1.5 inches long––the same length as the height of the wax. This meant that I had to somehow shorten my wax for the screws to go all the way through. Instead of trying to slice the bottom off my mold, I used a countersink drill bit to dive about 1/2 inch into the bottom of my wax mold. 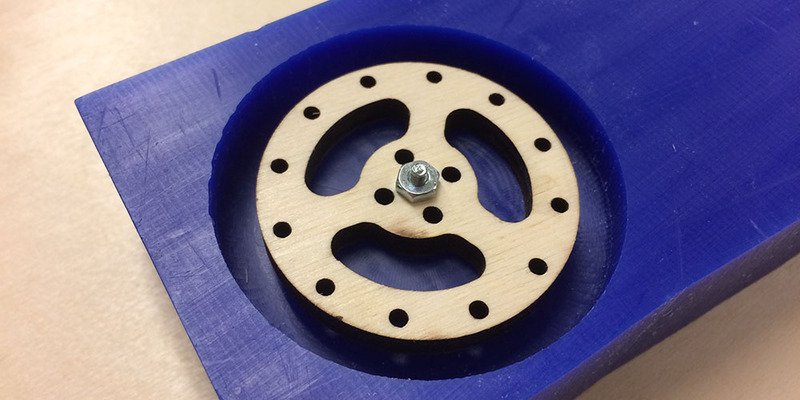 I lasercut my wheel hubs out of 1/4 inch model plywood. I chose plywood because of the natural porosity of the material. I thought the silicone would bond better to the wood than to an acrylic. I fixed the wheel hub to the wax mold with the screw and a nut. 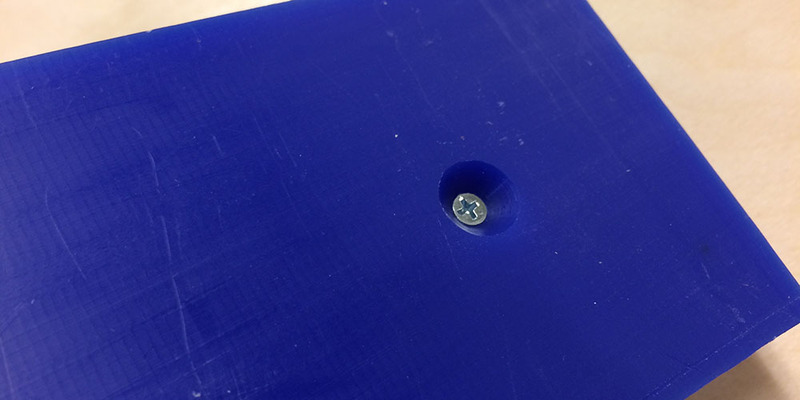 I used a wrench to make sure the hub was securely pressed against the mold. At this point, I had already spent about 3.5 active hours making the mold for these wheels. I was definitely ready to start pouring. I mixed the OOMOO mixture as per instructions and tried to carefully pour it into my mold. This turned out to be very difficult because the OOMOO was much more viscous and goopy than I expected. Halfway through, I tried tilting my mold to see if that would help, but that made pouring harder. I let the silicone set overnight then pried my wheel out with a set of pliers. Unfortunately, I was a little too aggressive and chipped my hub, but the wheel came out pretty clean. I also tried casting a second wheel by piping the OOMOO into the mold with a plastic bag. This method was much easier to control than the first pourig method. I trimmed the extra petals of silicon along the edges of the wheels. Not a perfect job, but it's probably fine for this iteration. The wheel has a few problems that I might need to address... A minor problem was the lack of control of the finish/flatness of the flat side of the wheel. But, the main problem was that the wheel was imbalanced which may cause stress on my axles (depending on my design). I may find I need to cast wheels from a two-sided mold. But that's a problem for another week.